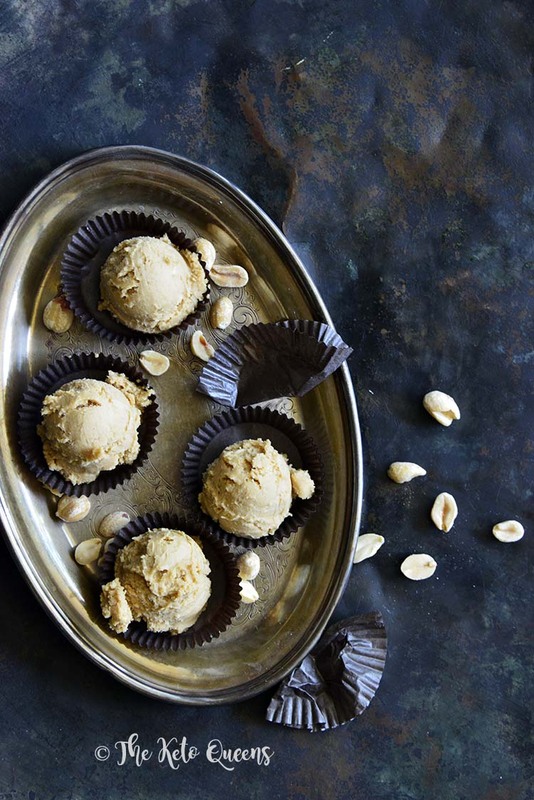 Keto Peanut Butter Cookie Dough Fat Bombs are a great way to satisfy a sweet tooth! If raw cookie dough is your thing, these are sure to become your new favorite. We like to use grass-fed cream cheese and butter so we know we’re getting maximum nutrition in each bite. Here’s a pro tip; if you crave the chocolate/peanut butter combo (we’ve had countless people tell us that before going keto, their absolute favorite candy bar was Reese’s Peanut Butter Cups), these fat bombs are for you! Just add a little sprinkle of stevia-sweetened chopped chocolate on top of each fat bomb (note that this will slightly change the nutritional values) and you’ll think you’re eating a Reese’s (but without the horrible sugar crash later). We can’t tell you how many times these have come to the rescue when a craving strikes! We love making a double batch of these and keeping them stored in the fridge when we need a quick snack. What are some of your favorite flavors of fat bombs? And also, what was your favorite kind of candy before you went keto? Keto Peanut Butter Cookie Dough Fat Bombs are a great way to satisfy a sweet tooth while getting in nutritious fats and staying in ketosis! Sprinkle a little stevia-sweetened chopped chocolate on top and they taste like a candy bar. Cream together the cream cheese and butter, and then beat in the peanut butter, Swerve Confectioners, vanilla, molasses, powdered stevia, baking soda, and salt. Divide into 6 equal portions, and store covered in the fridge. What is “Swerve confectioners”??? It sounds like some kind of sweetener, but stevia is already listed…and why do keto dessert recipes on the net always call for Stevia rather than the “yellow-pack’ sweetener? Is there a difference? Well, I see I need to do research… have been buying atkins bars, but going to have to, for cost, start collecting recipes to make my own snacks. This looks good. If I can find out what confectioners is, maybe I can try it after this Friday’s shopping trip. Thanks. Will be checking out more of your site. Oh, dear…okay, trying to see what I can get at Wal-mart, as we’re rural, and that’s about all we have. I can get Stevia there, but only thing I see listed on their page under ‘Swerve confectioners” is sugar….wouldn’t be calling for that in a keto recipe, would it? I’ll check on your page tomorrow…both for more recipes and to see if there’s some kind of note for us novices about what the ‘swerve” is. Thanks again! Sorry for the late reply! I’m out in California at a conference, were you able to find the swerve? You can get truvia, which they sell at my Walmart, and I have also seen Pyure. Both are stevia blends. Oooh, how did you know about my cookie dough addiction??? These sound incredible, plus I have to watch my carbs these days to avoid blood sugar spikes.